This article is about the English businessman. For the companies bearing his name, see Alfred Dunhill Ltd. and Dunhill (cigar). Alfred Dunhill FRSA (30 September 1872 – 2 January 1959) was an English tobacconist, entrepreneur and inventor. He is the progenitor of Alfred Dunhill Ltd. a London-based luxury goods company owned by Swiss company Richemont and the Dunhill tobacco products company owned by British American Tobacco (now two independently owned entities). From 1893 Dunhill ran a company selling motoring accessories, and in 1902 opened a shop in Mayfair. He developed a pipe designed for motorists in 1904. He opened a tobacconist's shop in St James's in 1907, offering tailored tobacco blends. Shops were opened in New York and Paris in the 1920s. With his international ambitions, Dunhill helped to create the modern luxury goods market. He retired from business in 1929, and married his mistress in 1945, following the death of his wife. Dunhill was born on 30 September 1872 at 2 Church Path, Hornsey, Middlesex. He was the second son of five children of Henry Dunhill (1842–1901), a master blind-maker, and his wife and cousin, Jane, née Styles (1843–1922). His father occupied premises on Euston Road, manufacturing harnesses for horses. Alfred Dunhill was educated at a private school in Hampstead and by tutors until he was 15, when he was apprenticed to his father's business. In 1893, Dunhill inherited his father's business and shortly afterwards began to supply accessories for motor cars under the name Dunhill's Motorities (a portmanteau of "motorist" and "priorities"). He married Alice Stapleton (1874–1945) on 15 June 1895. In 1890 he established the Discount Motor Car Company to sell his accessories through mail order. In 1902 he opened his first shop in Conduit Street, Mayfair, selling clothing and accessories to chauffeurs and their employers. He entered the pipemaking business in 1904 when he developed a "windshield pipe" to allow motorists to smoke while driving. In 1907 he opened a small tobacconist's shop on Duke Street in the St James's area. He offered tobacco blends tailored for the individual customer. In 1908 he introduced the first Dunhill cigarette. The shop rapidly prospered. His granddaughter Mary later described his flair as a salesman and a shopkeeper. The business expanded, and by 1910 Dunhill had taken additional premises in Duke Street. In 1912 he was joined in the business by his youngest brother, Herbert, and his eldest son, Alfred, followed by his second son, Vernon, in 1913. In 1912 Dunhill introduced the white spot trademark to its pipes. The post-war period witnessed both expansion and the commissioning of new products. The company always ensured its products were covered by patent and trade mark, a policy prosecuted with vigour from the outset. The early 1920s saw the wholesale and export side of the business move to Notting Hill Gate, close to the pipe and cigarette division located at Campden Hill Road. In 1921 the firm received its first royal warrant, as tobacconist to Edward, Prince of Wales. Dunhill also supplied Winston Churchill and Siegfried Sassoon. The 1920s also saw the opening of shops in New York and Paris. Bloomberg Businessweek opined that Dunhill prefigured the modern luxury goods market with its international ambitions. 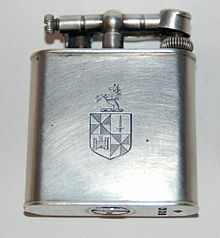 In 1924 the company launched the Unique lighter, a product that Dunhill and his brother Herbert had much interest in developing, and was the world's first lighter that could be operated with just one hand. Also in 1924, Dunhill published The Pipe Book, a monograph which detailed the history of the smoking pipe. In the New York Times review of the book, the anonymous author credited Dunhill with making pipe smoking "a gentlemanly diversion". The book has rarely been out of print since its publication. Dunhill was elected as a fellow of the Royal Society of Arts in 1925. Dunhill passed the chairmanship of his company to his son Alfred Henry in 1928, taking retirement due to health reasons. He left his wife and moved to Worthing to join his long-term mistress, Vera Mildred Wright (1902–1976), who changed her name to his by deed poll. Dunhill married Wright on 28 March 1945, shortly after the death of his wife. He died in a nursing home in Worthing on 2 January 1959, and was cremated at Golders Green Crematorium. He left gross assets of £74,117 (equivalent to £1,693,744 in 2018). His wife survived him. Dunhill, Afred (1924). The Pipe Book. London: A. & C. Black. OCLC 909095159. Reprinted: The Pipe Book. New York: Skyhorse Publishing Company. 2011. ISBN 9781616080495. OCLC 758870949. ^ "Alfred Dunhill, 86, tobacconist, dead". The New York Times. 5 January 1959. ^ a b c d "Mr. A. Dunhill". The Times. 5 January 1959. ^ a b c d e Linda Welters; Abby Lillethun (2011). The Fashion Reader: Second Edition. Berg. p. 509. ISBN 978-1-84788-589-0. Retrieved 20 February 2014. ^ Foulkes, Nicholas (2007). "Mechanisms for the Modern" (PDF). QP magazine. Retrieved 24 April 2014. ^ a b c d e f g h i j k l m Trompeter, Barbara. "Dunhill, Alfred (1872–1959)". Oxford Dictionary of National Biography. Oxford University Press. Retrieved 25 December 2013. ^ "Mr Alfred Dunhill". The Times. 9 July 1971. ^ Chris Harrald; Fletcher Watkins (2013). The Cigarette Book: The History and Culture of Smoking. Skyhorse Publishing Company. p. 110. ISBN 978-1-62873-241-2. Retrieved 20 February 2014. ^ a b "Mary Dunhill". The Times. 27 February 1988. ^ Hauptfuhrer, Fred (13 April 1981). "For London's Richard Dunhill, Life's a Lovely Pipe Dream". People. Retrieved 24 December 2013. ^ Moorcroft Wilson, Jean (2003). Siegfried Sassoon: The Journey from the Trenches: a Biography (1918–1967). Psychology Press. pp. 161–2. ISBN 978-0-415-96713-6. Retrieved 20 February 2014. ^ "Brand New". Bloomberg Businessweek. 2 October 2005. Retrieved 24 December 2013. ^ H.S.H. "The Pipe Book by Alfred Dunhill". Man. 25 (May 1925): 78–79. doi:10.2307/2840712. JSTOR 2840712. ^ "Books and Authors". The New York Times. 23 November 1924. ^ "Alfred Dunhill, Ltd". The Observer. 7 April 1929. ^ "Deaths". The Times. 22 June 1959. This page was last edited on 29 December 2018, at 11:42 (UTC).